5711 PAT U.S.A. (1861) Washington*. Free frank patriotic cover with bust in profile of George Washington and motto "We defend the land of Washington." 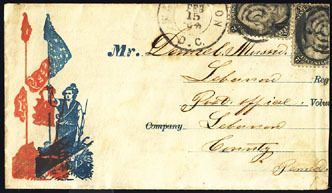 Includes return envelope addressed to 2nd Main Regiment, Company B. Free frank patriotic covers are hard to find. 9091 PAT U.S.A. (1861) Caricature of Bull*. Bale of cotton*. U.S. Civil War Patriotic cover with illustration of John Bull at entrance to a pawnshop and Southern gentleman with bale of cotton. Inscribed at bottom with the following conversation: Yancey - Mr. Bull, how much can you advance on Confederate Loan? J.Bull - I think I would rather advance on your Cotton."" William Yancey was a political leader of the southern cause, who realized that the entire cotton economy of the south depended on slave labor. John Bull, of course, represented Great Britain. Yancey made a trip to Britain a month before the Civil War but, while able to persuade them to remain neutral in the war, was unsuccessful in securing full recognition of the Confederate government. (Used Civil War patriotic covers are considered to be historic documents and are usually accepted in international thematic exhibits). Some minor soiling. Gorgeous and detailed illustration! 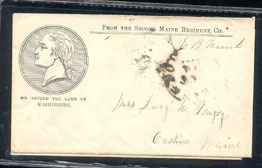 (Photo inside front cover)""
9121 PAT U.S.A. (1861) Stags*. Eagle*. Coat of arms*. American Flag*. Patriotic cover (patriotic covers from the Civil War are considered historical documents and are generally accepted in international philatelic exhibits) franked with 3 cent Washington rose Scott No 65, Yvert No 19 tied by large circular date cancel of Washington dated January 31st. Rare! 9154 PAT U.S.A. (1861) Flags*. Eagle*. Serpent*. Patriotic cover with color illustration of eagle carrying American flag and holding a serpent in its beak. The serpent is spitting venom on the Confederate flag. Inscribed below "Irrepressible Conflict! (Used Civil War patriotic covers are considered to be historic documents and are usually accepted in international thematic exhibits). US Scott No 65 tied by illegible circular date cancel. Some minor soiling and rough edges, but nevertheless a compelling design!"" 9947 PAT ETATS UNIS (1861) Homme chevauchant 2 chevaux*. Véritable scène de cirque. Extraordinaire enveloppe bicolore patriotique de la Guerre Civile (les enveloppes patriotiques de la Guerre Civile sont considérées documents historiques et sont généralement admises dans les expositions philatéliques internationales). 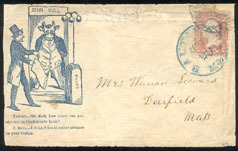 Cette enveloppe satirique montre John BULL en train de chevaucher en même temps le cheval du Nord (l'Union) et le cheval du Sud (les Sécessionnistes), le tout en portant une balle de coton. Apparemment le but de ce dessin est de montrer qu'il ne sait pas qui choisir! Envelope affranchie d'un 3 cents Washington rose Yvert No 19, Scott No 65 avec cachet à date de Washington du 8 mai d'Allegan dans le Michigan. Superbe et Rare! 4388 PAT U.S.A. (1862) Man* carrying bale of cotton* riding two horses simultaneously*. Patriotic cover "John Bull's Feat of Horsemanship," a veritable circus scene! Roughly opened at right and very slightly reduced on left. Interesting reverse image of front cover on back. 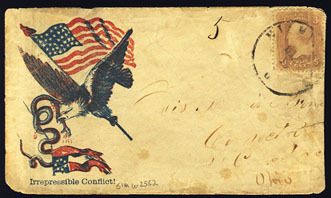 (Patriotic covers from the Civil War are considered historical documents and are generally admissible in International Philatelic Exhibitions). Scarce! 10720 PAT U.S.A. (1862) Miners*. Ship*. 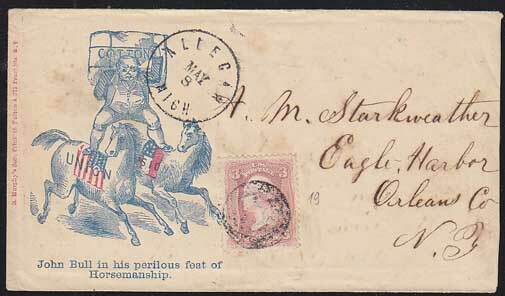 Interesting Civil War Patriotic cover (Civil War Patriotic covers are considered to be historic documents and usually accepted in International Philatelic Exhibits) of the 14th New Hampshire regiment. Cover franked by a 3 cent Washington rose, Scott No 65, Yvert No 19 tied by circular date cancel of Nov. 28th from Washington, D.C. Patriotic covers were used to ridicule the South or as in this case to glorify the Northern army. Very good condition. Exhibit item! 4356 PAT U.S.A. (1863) Hands shaking*. Flag*. Constitution*. Bundle of fasces*. 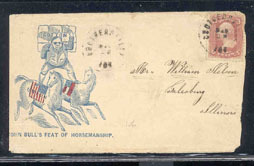 Patriotic cover with multicolor illustration to show the strength of the Union. Franked by 2 US 3 cent Scott No 65. (Used Civil War patriotic covers are considered to be historic documents and are usually accepted in international thematic exhibits). Very fine and lovely! 9001 PAT U.S.A. (1864) Farmer* with flag* and plow*. 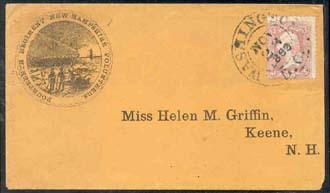 Patriotic cover with misregistered illustration. The picture was intended to be printed in two colors (blue and orange) but one color is shifted to the left by about 10 mm, resulting in a double impression! Two copies of US Scott No 73 tied by target, Washington cancels. (Used Civil War patriotic covers are considered to be historic documents and are usually accepted in international thematic exhibits). A rare usage, and unusual to find errors on patriotic covers!]"